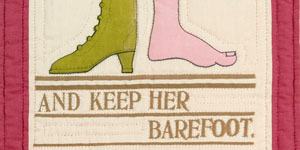 Katherine Bell, Quilting for Peace: Make the World a Better Place One Stitch at a Time (New York: NY: STC Craft, 2009). Betty Christiansen, Knitting for Peace: Making the World a Better Place One Stitch at a Time (New York, NY: STC Craft, 2006). Joan Tapper and Gale Zucker, Craft Activism: People, Ideas, and Projects from the New Community of Handmade and How You Can Join In (New York: Potter Craft, 2011). Viewing crafts as purposeful tools for activism is an attitude and action closely tied to developments within third-wave feminism to use one’s skills to connect to communities from the local to the international level. Many crafters who have come to identify themselves with the movement cultivate satisfaction in the creative process with the potential to make a difference in the lives of others even if it is as simple as providing a knitted hat or a quilted sleeping bag. Greer has further clarified her theory on the intersections of craft and activism on her blog. In March 2013, she laid out three types of craftivism: donation, beautification, and notification / teaching about causes through making. Craftivism as a theory has caught the attention of others who use more activist and feminist terminology: consciousness-raising, anti-consumerism, ethical production, and aiding the disadvantaged. Craft activism often has a public component or call to action. For quiltmakers, craftivism is a natural transition building on the long tradition of quiltmakers historically and currently making quilts for causes. The Boise Peace Quilt Project, the NAMES quilt, and the People’s Bicentennial Quilt are just a few examples of public quilt projects since the 1970s that would fall into the theory of craftivism. Knitting for Peace, Quilting for Peace, and Craft Activism are among the recent books documenting this phenomenon by highlighting individuals and groups involved in the movement.